Readers of my earlier post would have seen that I entered this year’s Ridgeway 40 event. 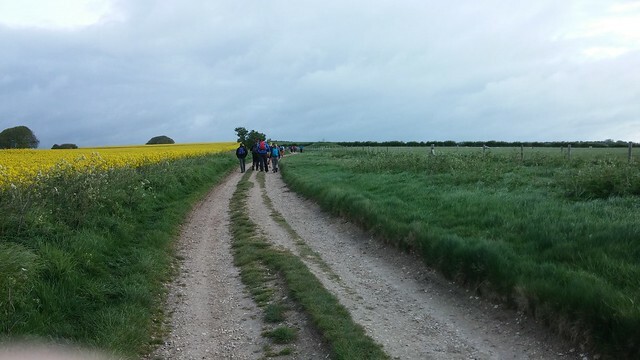 A forty mile walk (or run) along part of the ancient Ridgeway road from Wiltshire into Oxfordshire. I completed this in 9 hrs 31 minutes which I was pleased with. The weather was decent, windy, but not cold. It was overcast at first when setting off from Overton Hill, but the sun came out later and was plenty strong enough to get a bit of sunburn on unprotected legs. Keen to do a good time we started off with a slow run, completing the first 20 miles in exactly 4 hours. Thereafter common sense dictated a slow down to a fast walk and we passed the famous 26.2 miles distance in 5 hours 35 minutes. To be honest to get this time for a hilly marathon on rough tracks that can be hard on the legs (and requiring to save some energy for another 14 miles!!!) I was pretty pleased. Miles 26 to 36 were probably the hardest for me, but after reaching checkpoint 7, and with just one hill to go followed by a tarmac road downhill to the finish we picked up pace and averaged 15 minutes per mile for the last 3 miles, not a bad walking pace at all. My time meant that there were 47 people with faster times. The fastest time was 5 hours 38 minutes!!!!!! That’s 49 minutes before anyone else. The hospitality at the checkpoints and the finish was excellent, and the event was exceptionally well organised – many thanks to everyone! Although this event was the longest I’ve ever done, it wasn’t as bad as I had expected (OK, so all this means is that I had put in adequate training time). 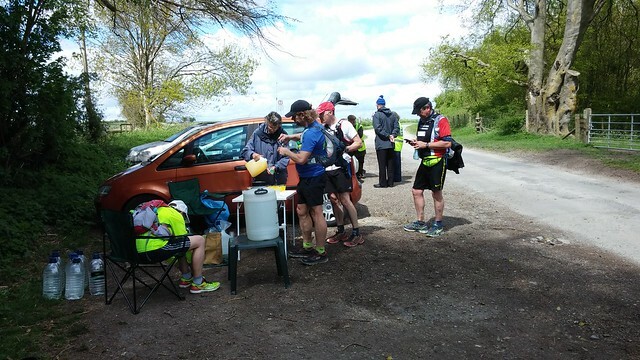 In fact, the worst hour of the day for me was the coach ride from Streatley to the start at Overton Hill, but such is the length of the event the coach ride lasts an hour and I don’t travel well. I recorded the event on a Garmin Forerunner 220 GPS Running Watch and was a little concerned as to whether the battery would last the distance. The specifications say that the battery would last for 10 hours in training mode, I started the event with it fully charged and at the event 20% charge remained, so it would have easily have gone past the stated 10 hours operating continuously. Also, a comparison of the track with two tracks recorded with different apps on my phone showed that it recorded the track with much better accuracy. Uploading the track to the Garmin Connect website also allows you to do some good post event analysis. This entry was posted in Running, Walking on May 12, 2015 by Jonathan.